BETWEEN A ROCK AND A HARD PLACE. In the year 2458, injured ballerina Blade Sinclair agrees to participate in the Galactic Olympic Games. Unfortunately, she’s on the wrong team; an alien team. If Blade doesn’t win a gold medal, her family will die. If Blade does win, the Sarthox will destroy Earth. What’s a girl to do?? LOVE HURTS. Security chief Christopher Bainbridge has had his share of traitorous females. 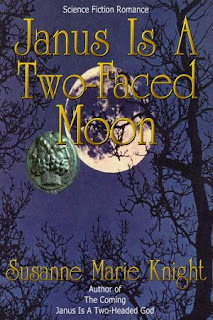 At the Lunar Olympic Games, he finds himself mixed up with another one. But Blade doesn’t seem like a typical traitor, and against his own inclinations, he falls in love with her. How can he help her escape from the Sarthox and save the solar system at the same time? Blade has just received *very* alarming news from attractive but disapproving security chief Christopher Bainbridge. Discussing him with her roommate, Heidi, Blade will soon learn about Heidi’s connection to Christopher. Despite the lower gravity, Blade dragged her feet to the Olympic Village apartment. The time was almost eight at night, and she’d been going strong since six in the morning. She opened the door, stepped inside, and waited. Absolute silence greeted her; her roommate Heidi must’ve still been out. Good. Blade didn’t need any distractions as she mulled over the events of the day. Not the least of which was the encounter with Christopher Bainbridge. Sitting on a heavy duty plastic chair, she removed her tattered ballet slippers and winced at the new blisters and welts appearing on her toes. Air ballet routines were not completely performed up in the air, and dancing on pointe on the ground was always hard on the feet. She took out her handy survival kit and wrapped every toe, especially the pinkie, with medical tape. Blade sighed. Heidi stood in the doorway. By her messy hairdo and droopy eyelids, it was obvious that she had been sleeping in her bedroom. “It was okay.” Blade made an automatic reply. Unfortunately her coach, Plevake, was absent for practice, and a new partner always took some getting used to. But the son, Jevake... well, he was different in an indefinable way. While his dancing technique contained no flaws, it contained no passion either. She shivered as she recalled his cold touch. Instinctively, her skin crawled, for if what Christopher Bainbridge said was true, then Jevake and his father were inhuman--alien. But how could that be? If the Sarthox were aliens, then that meant Blade was competing in the Olympics against Humanity. While she wasn’t overly patriotic, she was Human, after all. Here was a line she didn’t want to cross. Blade lathered up, then rinsed off. Water was a precious commodity on the Moon. Only the wealthy had unlimited access. Glad to leave that discussion behind, Blade rushed out through the living room into the entryway. The whole situation was disturbing--Jevake, aliens, Sarthox... Christopher Bainbridge. Holy cow, it was him, Bainbridge. All six foot two of him. Even in the dim corridor light, the sight of his broad shoulders, muscular chest, and slim hips caused her to unthinkingly lick her lips. She’d seen plenty of well-physiqued men before; her ballet company had been full of them. But this man, he made her insides quiver. “Miss Sinclair, may I come in?” He stood with his arms folded against that powerful chest. “Why?” She hadn’t meant to be rude. Her question just popped out. But then after all, she’d had a very trying day. The expression “dead tired” must’ve been created just for her. She tightly bunched the edges of her robe together at her neck, then stepped aside to let him in. Never normally prudish, she felt an unaccustomed shyness creep over her. Being clad only in a robe with her hair still dripping water did nothing to bolster her confidence. Blade flushed. Somehow this bad situation got worse. Bainbridge looked uncomfortable as he gently but firmly detached Heidi from his person. He darted his gaze to Blade, then looked back at Heidi. Oh. Blade must’ve blazed redder than a case of tomatoes. The worse situation just got even worse. Her brother? Of all the people in the entire galaxy.... Yep, everything was going to hell in a handbasket now. Not looking at him, Blade muttered, “Great.” Was there a convenient hole she could crawl in? “C’mon, let’s sit.” Heidi went over to the VR window and selected an image. The picture of soil and farm buildings immediately appeared--a view from her home planet. Hurrying into the bedroom, she flung the door shut, then fell back against it. Her emotional side scolded: Well, you really stepped in it, didn’t you Blade?